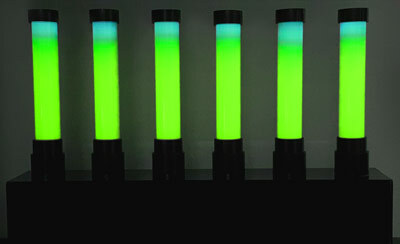 The Definiton of Light Sculpture: a Three-Dimensional Piece of Art that Uses Light Bulbs, the Sun, or Another Light Source as the Primary Medium of Expression. 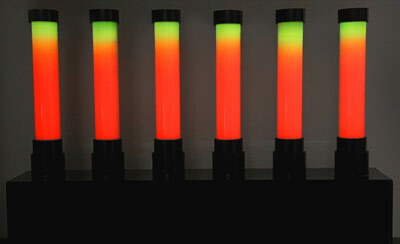 The Definiton of Light Art: is an applied arts form in which light is the main medium of expression.  It is an art form in which either a sculpture produces light, or light is used to create a "sculpture" through the manipulation of light, colors, and shadows. 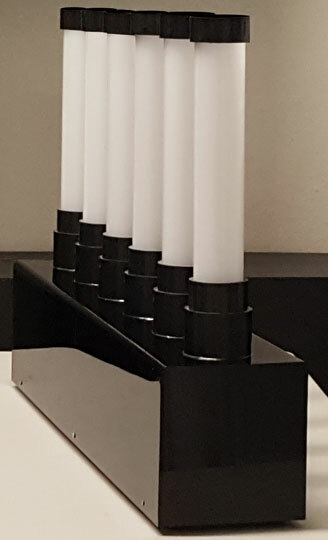 Many of our lighted creations fall under the category of Light Sculpture and Light Art and can be used for decorative purposes for residential and commercial settings. 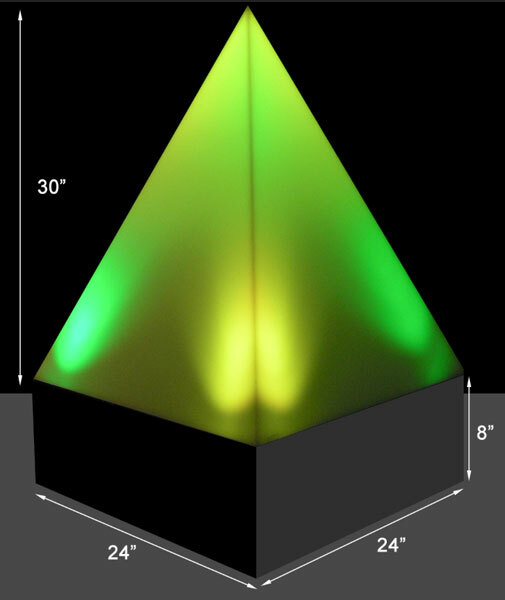 Many of our light sculptures can be custom made to varying sizes and shapes. Bottom base is 30"L x 6" deep x 7"H, shown with gloss black laminate. 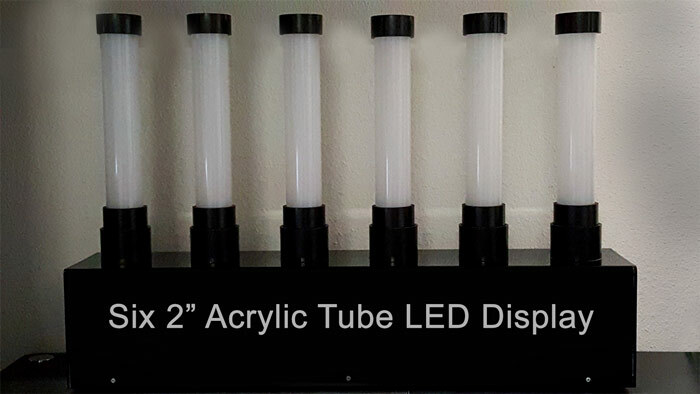 Overall height of display with acrylic tubes is 20". 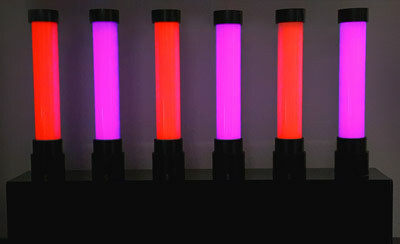 Custom sizes are available with wider and longer tubes. 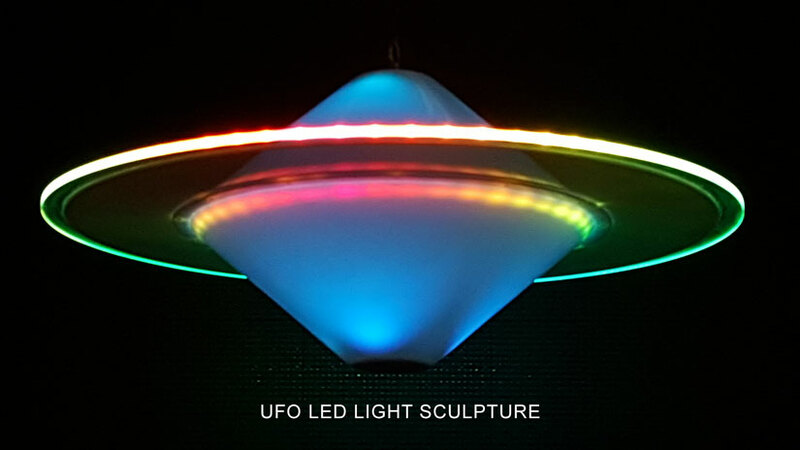 Shown above is our UFO LED Light Sculpture which is made of white translucent acrylic, clear acrylic and fully programmable LEDs. 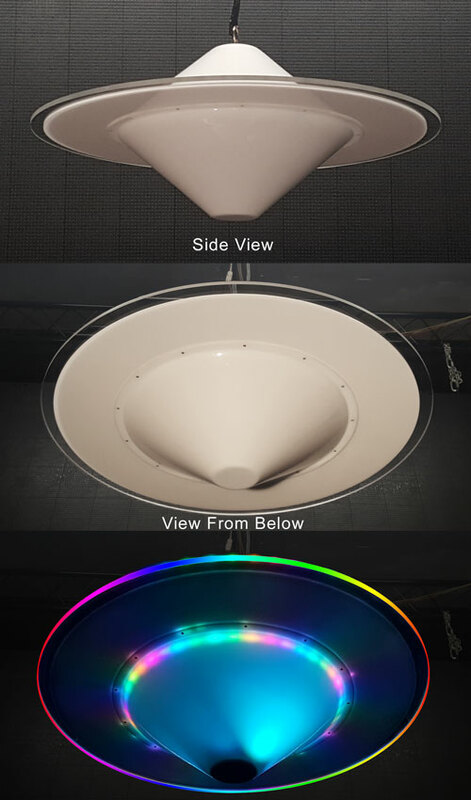 To our knowledge it is the largest LED lighted UFO model shown on the internet. Note: Battery operated versions are available. 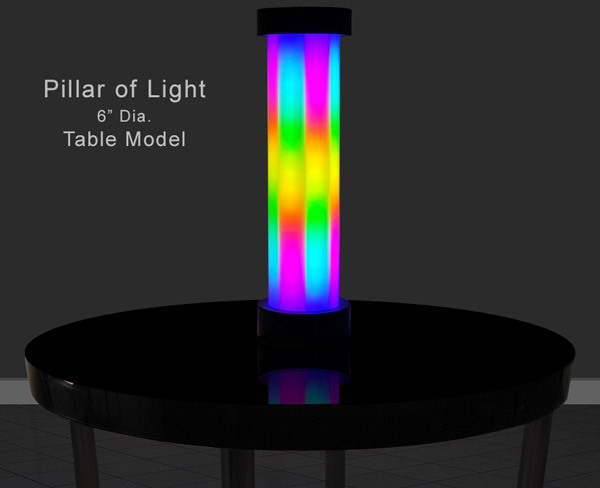 The 6" diameter Pillar of Light column is also available as a floor model. Available sizes are 40", 52", 64", and 76" tall with a 10" wide base and top cap. 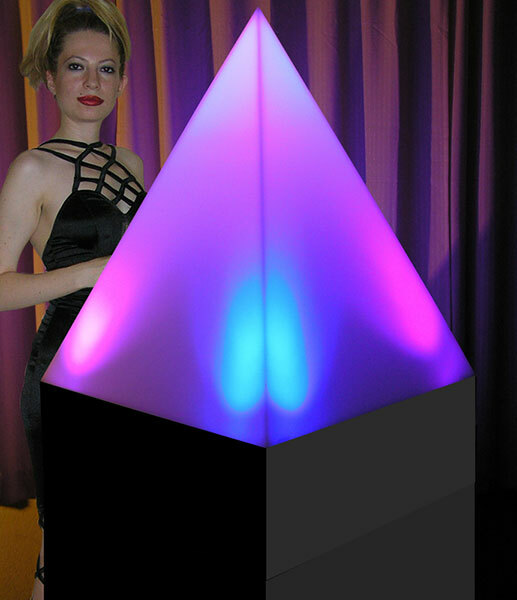 This Acrylic Light Sculpture is made with 1/4" thick white translucent acrylic that is 24" at the base and 30" high. The base is made of 1/4" black acrylic, 24" square and 8" high. It's an impressive piece for any interior, even with the lights off. 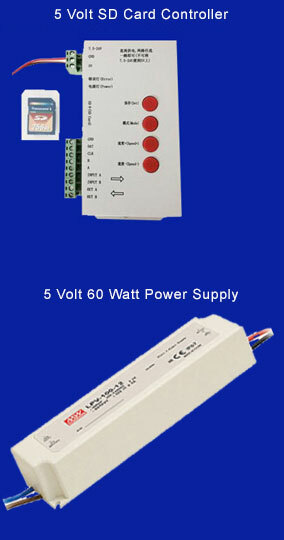 The LED lights can be controlled with the included remote control. The remote allows you to dim the lights or to turn them on/off, as well as making the color white. 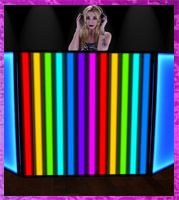 You can control all lights simultaneously, in which case all lights are the same color with either 4 of the available modes; slow strobe, slower strobe, color fade, slower color fade. 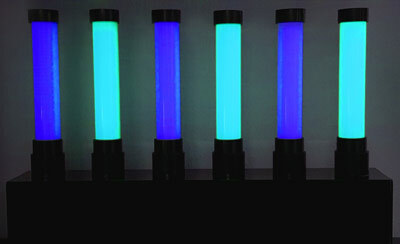 Each of the 4 LED bulbs can be controlled separately allowing the user to make an individual setting for each. You can set each bulb in slow fade but starting at a different color, for example, giving you 4 separate colors at one time.